Dynamic Mixed Mode provides a convenient means of providing repeater coverage for both analogue and digital radio users. However there are some situations where IP Site Connect and analogue service many be desired. Dynamic Mixed Mode does not support IP Site Connect, but there's another means to provide local repeater coverage, in analogue, when needed. This configuration would allow an analogue radio user to bring the repeater out of digital mode by means of Select-5 signaling. There needs to be a third channel added to the repeater. 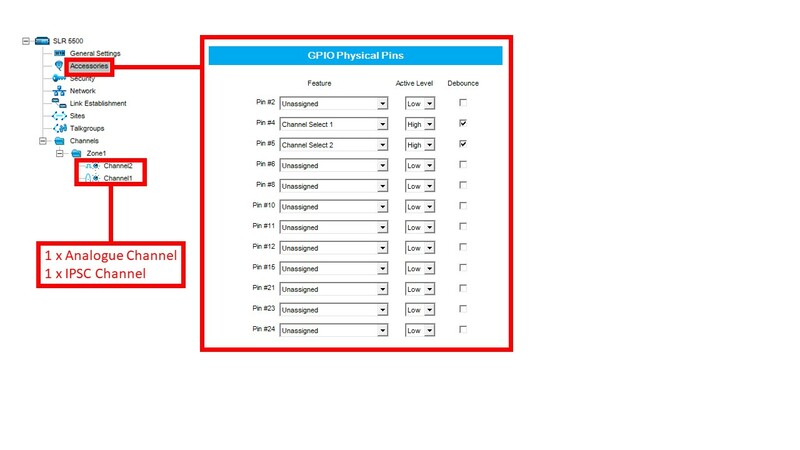 If Pin 4 and 5 are low then the repeater will go to channel 1. If Pin 5 goes high, the repeater will switch to Channel 3! These would need to be sent on the receive frequency of the DM4400 in analogue mode. Sending 080001 from another radio causes pin 17 on the DM4400e accessory connector to go high (assert). This changes the state of pin 5 of the SLR5500 accessory connector to high which in turn causes the repeater to select Channel 2. Channel 2 is selected becuase pin 4 - Channel Select 1 - is tied to ground. Channel Select 1 and Channel Select 2 form the BCD number of the channel - so 01 and 00. Since there is no channel zero, the repeater reverts to channel 1. Pin 18 on the DM4400e and pin 4 on the SLR5500 are the common ground. Sending 080002 from another radio will cause pin 17 to go low (de-assert) again. In this state the DM4400 should not (must not) transmit. By default, ZVEI 40ms is used. The repeater could be controlled from a digital channel using telemetry - in fact more channels could be controlled this way! An acknowledgement could be sent from the DM4400e to confirm that the request has been received. In this case, you need to make sure the DM4400e has its own antenna (that it can transmit on). I am assuming that RDAC cannot be used but if it can, this makes more sense.